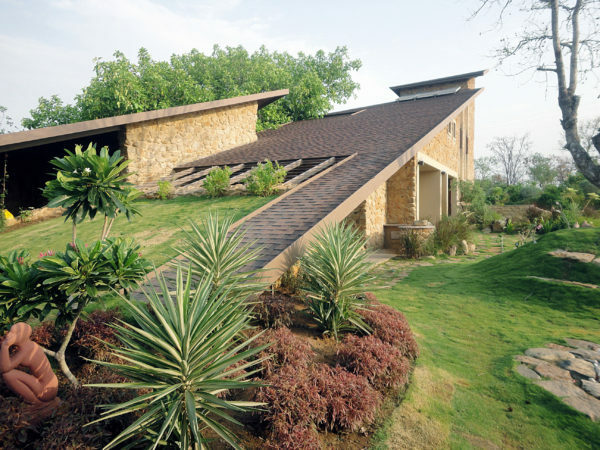 Architect Shirish Beri is the receipient of J.K. Great Master’s award for his adventures in contemporary Indian architecture during the past four decades. This award was decided by a jury of earlier winners of this award. It is awarded to only one senior architect (above 60 years of age) from India and ten nearby countries once in every two years . The award ceremony date and venue would be announced soon. Some of the earlier recipients of this prestigious award are Ar. Laurie Baker, Ar. A.P. Kanwinde, Ar. Charles Correa, Ar. B.V. Doshi, Ar. Jeffery Bawa (Sri Lanka), Ar. Mazrul Islam(Bangladesh), Ar. Anant Raje, Ar. Christopher Benninger and Ar. Raj Rewal. Humbled and gratitude towards the fraternity and younger generation, he has created an endowment fund for a truly deserving student from C.E.P.T Ahmedabad.This will be for him/her to take a pause to decide on his / her future direction and explore the relationship between architecture and his life. He has also won the Arcasia gold medal for the best designed single family residence amongst 21 countries in Asia. 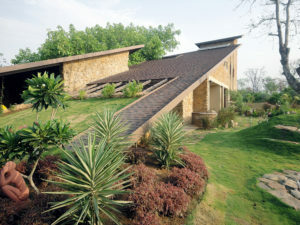 The main challenge in this design was to explore and create, in today’s fast paced, stress ridden and volatile atmosphere, an environment that would bring about an empathetic bonding with nature which would not only help in calming one’s nerves, but also nurture and rejuvenate the inhabitants to face this world with renewed positive energy. To achieve this, the architect chose to involve and integrate the beautiful existing Banyan and the Behada trees in his design. 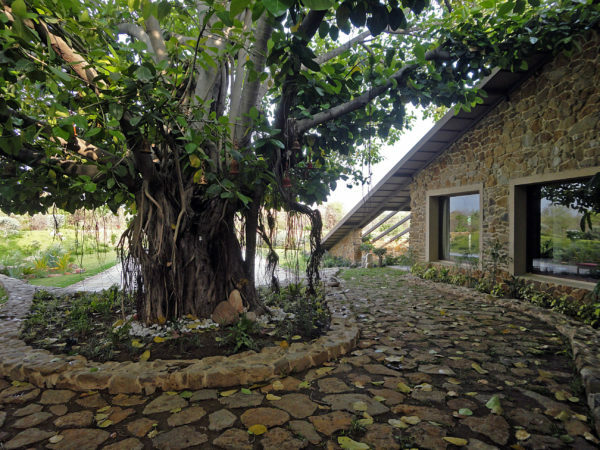 In spite of the client’s wish to construct elsewhere, he felt that these trees must become an integral part of this farmhouse by spreading their branches not only for the much desired shade and coolness, but also for spreading cheerful empathy and healing energy. Thus, the house was designed around the main banyan tree as the central focus, allowing each space in the house to converse with it. This Banyan then started a dialogue with the other Behada tree through the creation of an axial lap pool between these two trees. A refreshing ambience is created by breaking the rigid boundaries between the enclosed spaces and the open spaces. We enter the house through a narrow covered passage placed on the North – South axis of the Banyan As one emerges from this passage, the Banyan reveals itself in all its glory, bang in front of you. 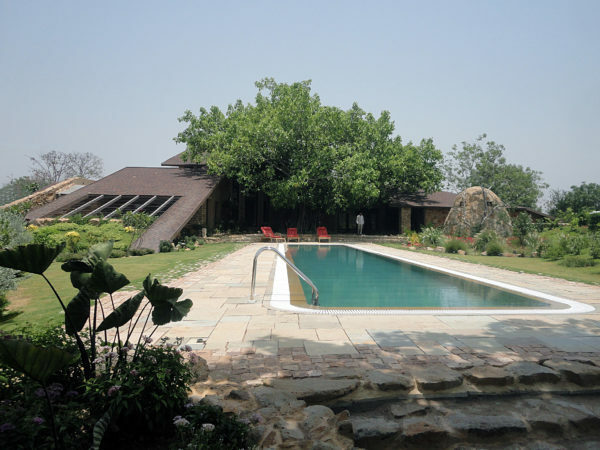 On the left side, we see the landscaped court with the lap pool and the Behada tree at the other end. On the right is the semi open verandah as a precursor to the main living – dining spaces. The experience at this entry point is multisensory. 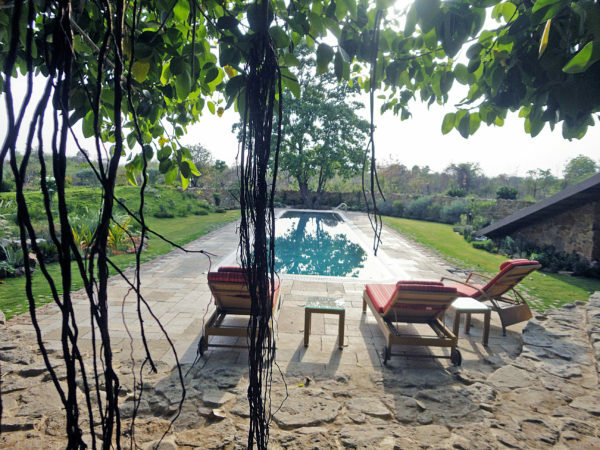 We hear the gurgling of a water stream coming through the house from the other side amidst the rustle of the Banyan leaves and the chirping birds; we smell the plants and the flowers and feel the westerly breeze on our skin. The rough hewn stone flooring in this courtyard massages the soles of our feet. 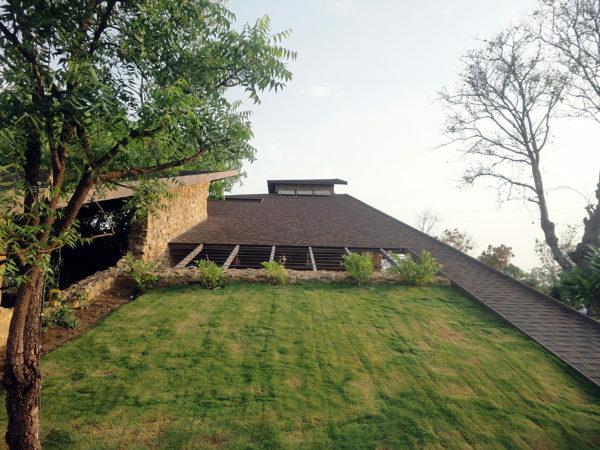 The architect felt that this house could not be just plonked as an alien element on the site but had to be rooted in the soil and also grow out of it. Thus the house gradually rises right from the ground in a tapered form on the south and the west side. The ochre skinned boulders obtained on this site were used for the major masonry walls. They too helped in visually blending the house better with the site and made the abode more eco friendly with reduced embodied energy and greater insulation. Their rugged natural appearance is also maintenance free. The surrounding landscaping avoids forced, formal, artificial layouts in order to create a more natural environment. The interiors also have been designed to gel with the overall rustic character. One feels a joyous, calming psychological transformation in one’s inner space as one experiences this house’s outer spaces. This can happen only when we are able to connect to our roots ..to mother nature.